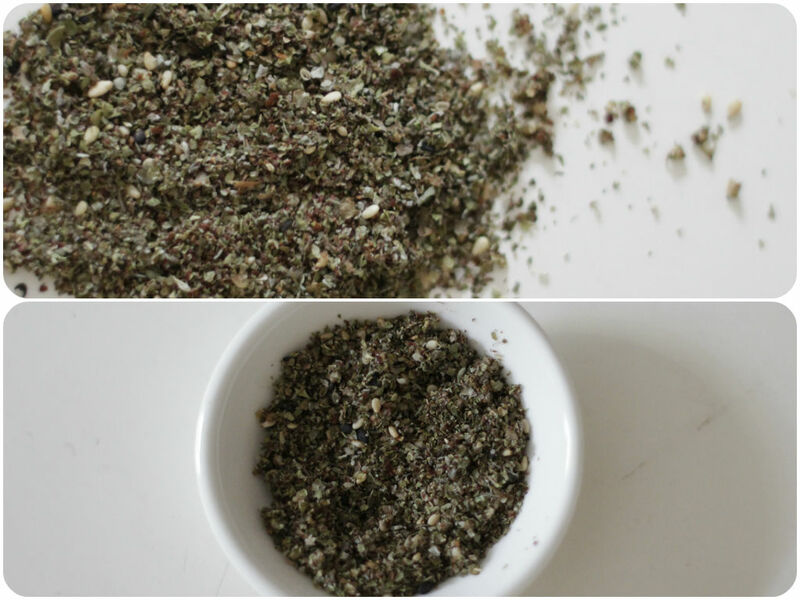 Have you heard of Za’atar before? I’m really into spices at the moment. I recently discovered about this spice blend through other food blogs. It is Middle Eastern spice blend made from the dried herbs, sesame seeds, sumac and salt. The word refers to wild thyme herbs. It’s commonly eaten with pita bread, dipping in olive oil and then za’atar. It’s also good for seasoning meat or veggies, sprinkling on hummus, and eating with labneh (cream cheese made from yogurt). It is aromatic, earthy and tangy. Health benefits? Sumac is rich in gallic acid. It is anti-fungal, anti-viral, anti-cancer, anti-inflammatory. Amazing thyme is rich in thymol and carvacrol which is also anti-septic, anti-microbial and powerful antioxidants. It also helps with the digestive system and eliminate drowsiness and depression, improve your memory and mood by increasing dopamine and serotonin. Sesame seeds contain lipophilic antioxidants, which may prevent age-related diseases. I’m making this salad to take to my friend’s BBQ tonight. Yes, feed some goodness to the crowd! She and her husband are off to a 2 or 3-year-long-caravan trip soon. Her husband is originally from Melbourne. So after going around up north, Broome and Alice Springs, they will eventually move back to Melbourne where we can meet up again hopefully in a couple of years time. I’m so excited for them and cannot wait to hear about all the random stories about camping. I’ve never done real camping before. We call it “Glam-ping” in Korea (Daniel will nod his head). We enjoy all fun parts like barbequing, playing games, relaxing in the tent or caravan car during the day, campfire, chit-chats at night. Then we go and sleep in hotel, which means no sharing dirty bathrooms or uncomfortable air-mattress. The hotel we stayed in Jeju island for our honeymoon actually has a package for it. There is even guys setting up the barbeque and cleaning up afterwards. Well..maybe it is a bit extreme, but sounds good to me 🙂 I should try real camping one day. 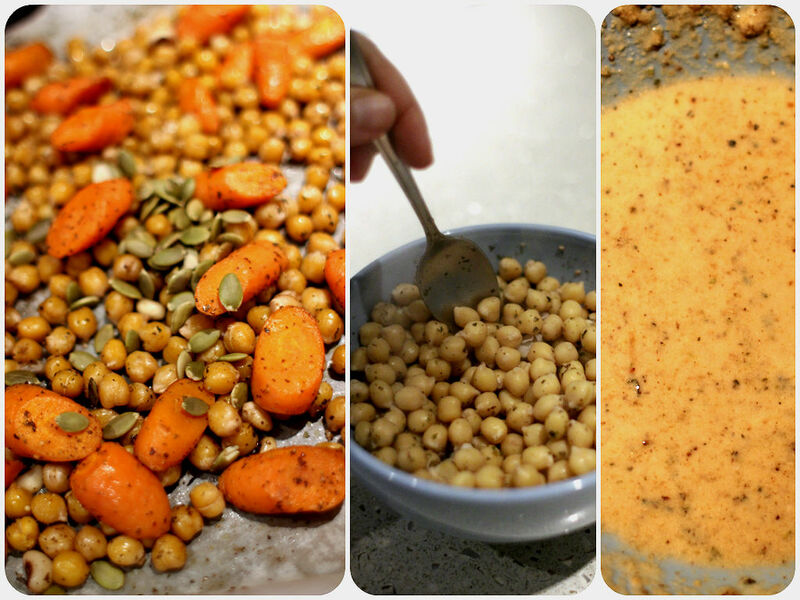 Combine cooked chickpeas, sliced carrots, coconut oil and za’atar spice in a mixing bowl. Put it in the preheated oven (180) for 30 minutes until cooked, tossing them occasionally. In the meantime, make a za’atar-tahini dressing. Combine roasted chickpeas, carrots, chopped tomatoes and green salad with half of the dressing. Transfer to a salad bowl. 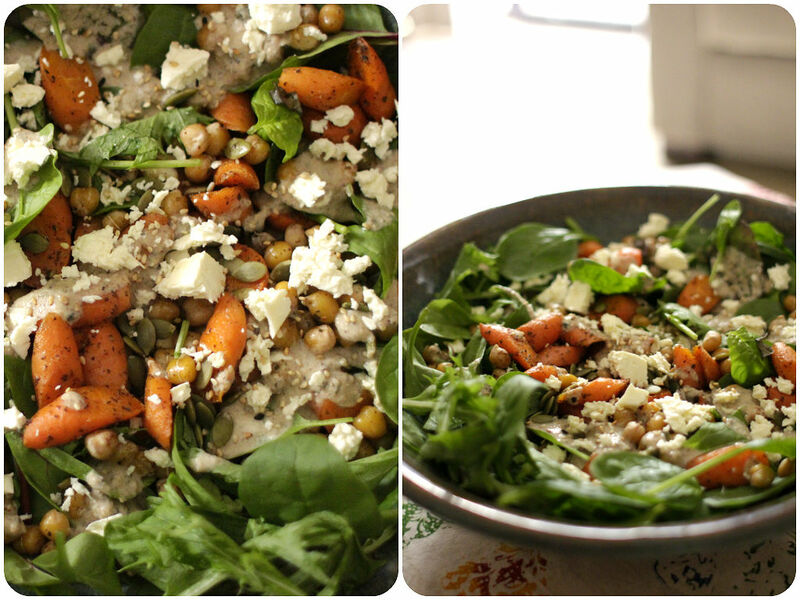 Sprinkle pepitas and crumbled feta cheese. Drizzle the rest of the dressing on top.